“Elevating toilet seat aids elderly and has removable padded arms will add more comfort to a caregiver, family member or an elderly person himself. Standing up from the toilet or using the bathroom has never been easier. This raised toilet seat is a multi-way solution for someone who is recovering from a hip surgery, a foot injury or any person with limited range of motion. The distance between an upward position and the seated position for a person recovering from a surgery and in pain can become a real obstacle where bathroom visitations are concerned. A raised toilet seat can become a great solution and an answer to many questions. Setting it up is very easy. Just put your current cover for the toilet aside, set the elevated toilet seat on top. Using the special locking mechanism secure this raised toilet seat in place. 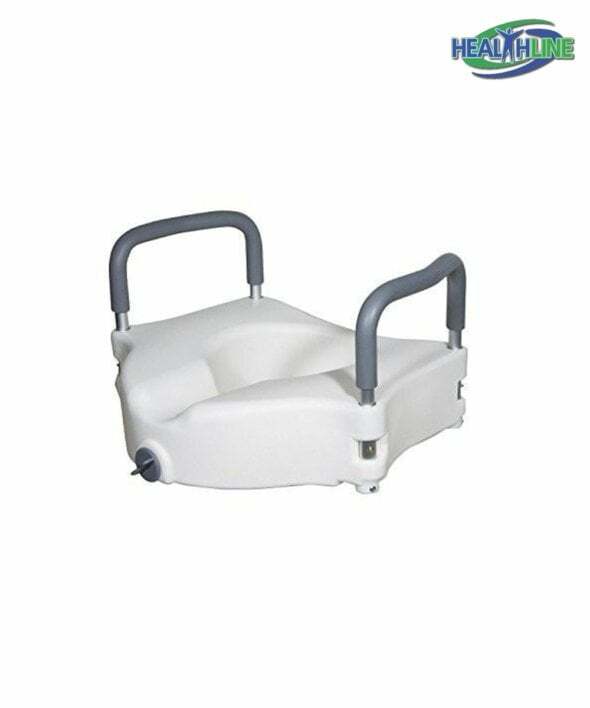 Lightweight, easy to use, clean and maintain this toilet seat solution is very simple to pack for travel or storage. It does not require any tools for assembly or taking apart. Compatible for both genders: men and women. Padded arms make it simple and safe to grab and can be easily removed when it’s time to transfer the patient. Elevating toilet seat aids elderly and has removable padded arms will add more comfort to a caregiver, family member or an elderly person himself. Standing up from the toilet or using the bathroom has never been easier. This raised toilet seat is a multi-way solution for someone who is recovering from a hip surgery, a foot injury or any person with limited range of motion. The distance between an upward position and the seated position for a person recovering from a surgery and in pain can become a real obstacle where bathroom visitations are concerned. A raised toilet seat can become a great solution and an answer to many questions. Setting it up is very easy. Just put your current cover for the toilet aside, set the elevated toilet seat on top. Using the special locking mechanism secure this raised toilet seat in place. Lightweight, easy to use, clean and maintain this toilet seat solution is very simple to pack for travel or storage. It does not require any tools for assembly or taking apart. Compatible for both genders: men and women. Padded arms make it simple and safe to grab and can be easily removed when it’s time to transfer the patient.